This product is expected to ship on Wednesday, April 24 if you place your order within the next 18 hours and 8 minutes. It’s important to have the right sort of desk wedge and card holder for your office. 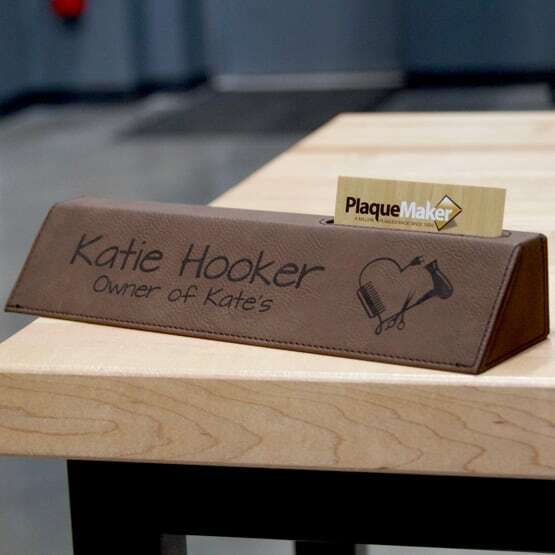 But there’s no need to worry: PlaqueMaker.com has you covered with our wide selection of personalized name plates, including the Faux Leather Dark Brown Desk Wedge with Business Card Holder. This wrapped faux leather desk wedge will add the perfect rustic touch to your office. 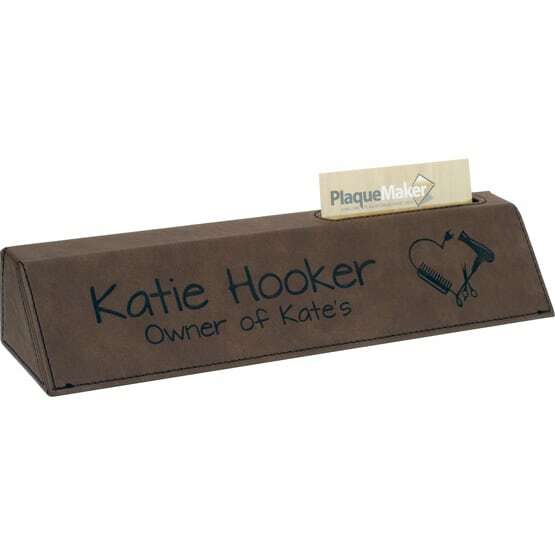 Customize your own Faux Leather Dark Brown Desk Wedge with Business Card Holder with your own name, title, and artwork using our online design tools. The capability of creating yoru own design will ensure that the desk wedge is perfect for you! Stuck in the design process? Allow our team of graphic designers to create the perfect desk wedge for you. Just type any special instructions about the design in the “Additional Notes” and we will send you a proof of your professionally designed desk wedge. 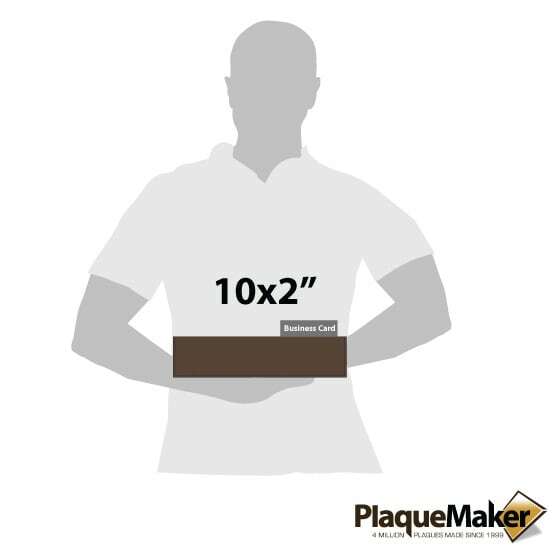 PlaqueMaker.com has a proud history stretching across more than 20 years, and our success has been built on our dedication to customer satisfaction. We maintain our reputation of giving you only the highest-quality items, and we also continue to expand our line of products to include personalized name plates, awards, plaques, desk wedges and more. With the rich variety of customizable options, professional quality, and low prices, you can’t go wrong with PlaqueMaker.com. Whatever sorts of personalized name plates or desk wedges you need, we’ll help you find the perfect match for your desk, business, or home. Contact us about our plaques and buy one today. Overall Size: 10 11/16 x 2 1/2"
Personalization Area: 9 7/8 x 1 7/8"